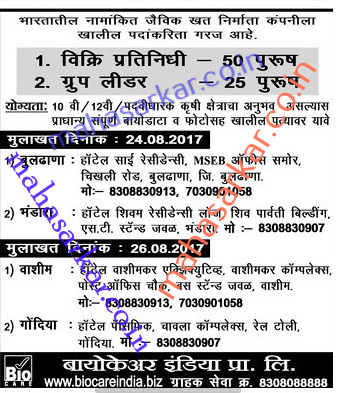 Bio Care (Bio Care Pvt Ltd), Maharashtra Published Job Notification for 75 Sales Representative & Group Leader Posts. Candidates who wish to apply must look at Bio Care Recruitment 2017. Eligible candidates can join Walk-in Interview on 24-08-2017 & 26-08-2017. Education Qualification: 10th /12th pass and More. For Post wise Education Details follow the detailed advertisement. Hotel Sai Residency,Chikhali Rd, Buldana, Maharashtra 443001. Hotel Shivam Residency Lodge, Shib Prvati Building, Vandara. Hotel Washimkar Executive,Washim, Maharashtra 444505. Hotel pacific,Rail Toly, Gondia, Maharashtra 441614. Starting Date, Last Date to Apply offline at Bio Care Pvt Ltd which candidates should be remember as follows. Walk-in Interview date: 24-08-2017 & 26-08-2017.